I have had it in my mind for quite some time to make matching garments of some kind for the girls, but I could not decide on the right thing. I did not want to make sweaters - my mom has made the girls several, so I felt like that had already been done - and I wanted what I made to be very girly, pretty and a little different. So after much deliberation and after having the incredible fortune of finding this gorgeous colored yarn at a sale, I decided to make ponchos. 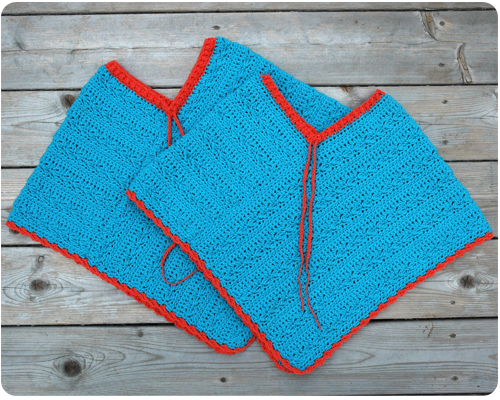 The yarn I used for this project was Bernat Baby Cakes - 'Up in the Air' for the main part of the ponchos, and 'Punkin' for the trim. My original plan was to make Claire's poncho in 'Punkin' and then trim it in 'Up in the Air', but the orange was a little brighter than I thought it would be when I started working with it, and I did not want to make her a triangular garment in orange and run the risk of her looking like a pylon when she wore it. 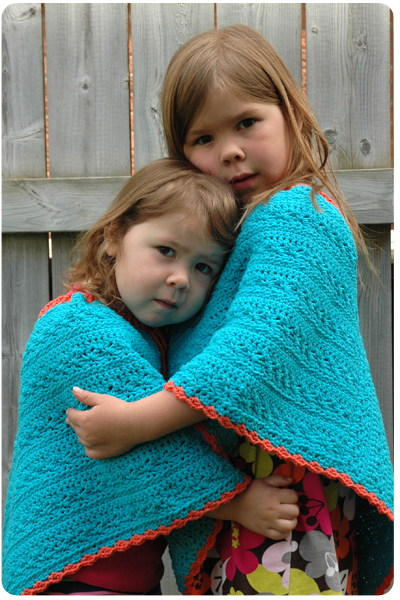 So both the girls' ponchos are the same colors, and I have a ton of orange colored yarn to add to the stash bin. Oh well, moving on. How cute is this picture? 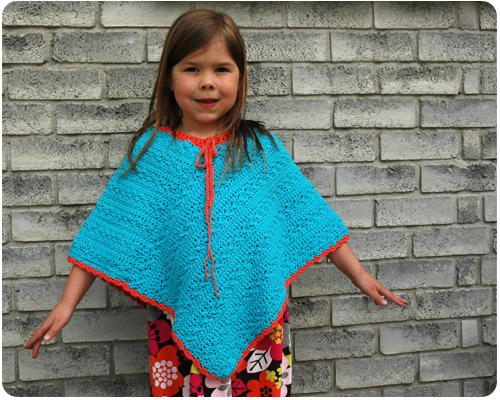 We had a lot of fun at our 'Poncho Photo Shoot'. I love dressing my girls alike, and they love it too. 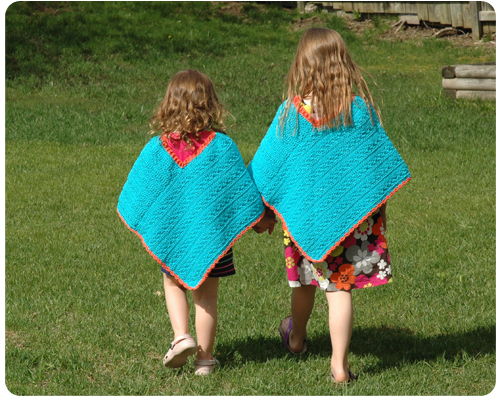 They are so excited to having matching ponchos that Mommy made for them. And they look adorable wearing them. What else could I ask for really? These are beautiful. I wish I could make them but my hands don't hold a crochet hook very well anymore. 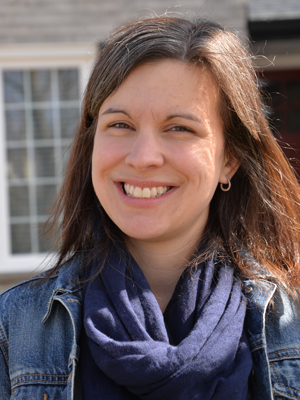 Thanks for sharing at my blog hop. I'm your newest follower. Hope you will come to my hop each week and share your talent with us. Welcome Angel and thank you for following along. I really enjoy your blog hop - I love to share what I have done and love to see what other creative people are up to; I'll be back to link up for sure. Thanks for reading. What adorable pictures of the girls. I love the one of them hugging each other in their cute ponchos. Thanks Lanaya. I love the picture of the girls hugging too - one of my new favorites. Aww, the girls and the ponchos are both super sweet. I love the colors you choose. Thank you Leslie. 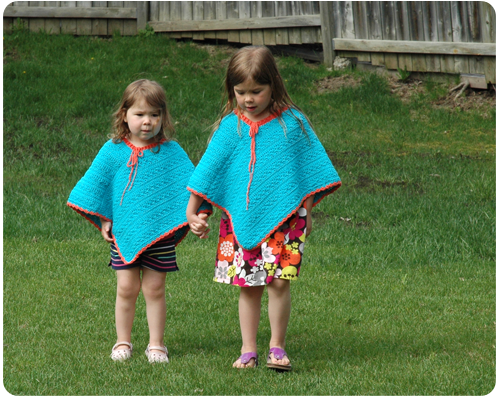 Making these ponchos was so much fun, and seeing them on my girls made me so happy. Thank you for reading. Rachel, those ponchos are gorgeous. And so are your little girls. Those are some great pics for scrapbooking. The hugging picture is precious. Thanks Leslie. These photos will be appearing on a scrapbook layout very soon, I promise you; the picture of the girls hugging is one of my new favorites. I love the ponchos, and the photos of the girls are precious! Great job. Thank you so much for sharing at A Bouquet of Talent. Hope you are having a wonderful week. Thanks for stopping by each week and for all your lovely comments. Hi, I love the poncho. I've been looking for this pattern for a toddler. I really would appreciate if you can share it. Fran, I would be happy to share this pattern with you. 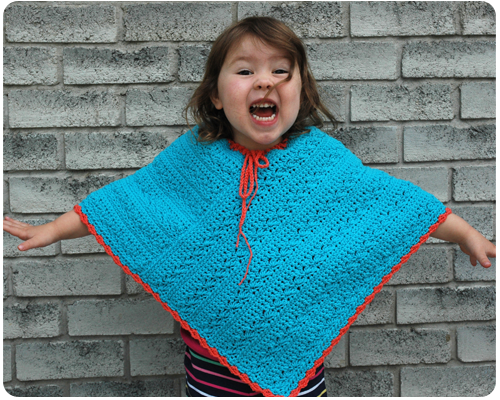 If you could email me at info@craftycucumber.com I would be happy to scan the pattern I have and send it to you. Thanks so much for stopping by.